UmtAudit Manager is designed to allow you to easily create, edit and manage your audit at the comfort of your PC. Once you have completed your configuration, in a simple click you can transfer the study to any number of PDAs and you will be ready to start your assessment. Did you forget to program a question? Don’t worry, as you are able to add it directly into your PDA... the program is easy to use and made to be flexible! To the left is an example of the UmtAudit Manger worksheet - each cell can be programmed individually. Once transferred to a PDA, you will see three columns at a time, so you can design the layout to be easier to use. Click the key you wish to program from the UmtAudit Manager worksheet, and simply complete the dialog box that appears. Remember - you have virtually unlimited amount of elements that you can program as either questions, or checkmark questions or answers. Make answering questions easier by having criteria with pre-programmed text - all you have to do is choose the criteria that matches your assessment and the text is automatically inserted into your report. It's that simple! 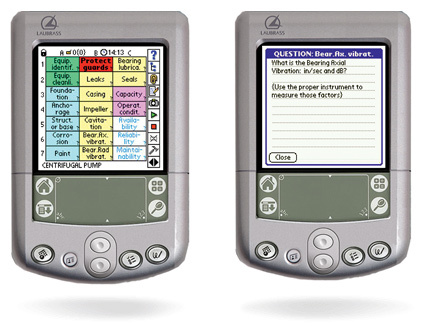 Record your assessments easily on a handheld computer - no more piles of paper! UmtAudit is designed to facilitate and optimize your auditing process. Once you have completed your study, simply transfer your observations back to your PC and your audit report is ready! Below is an example of what UmtAudit can look like on a PDA. Not only are PDAs easier to record data on, they are also useful for storing all of the information that you may need to make an accurate assessment. The UmtAudit™ program has a wealth of features that help you to make your assessments more efficiently. To learn more about how this program can benefit you, please view our online demonstration. This statistical program offers a wealth of features that help you to analyze your data and share your results. To learn more about how this sophisticated software can benefit you, please view our online demonstration.